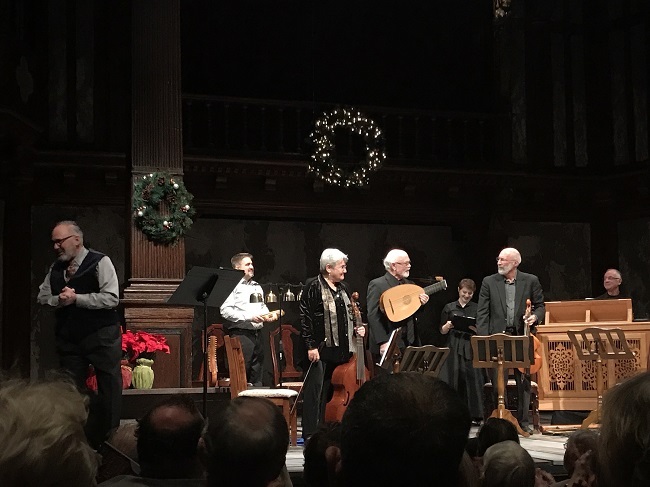 Christmas has come early to the Folger Shakespeare Library in the form of "A Christmas Messe," skillfully performed by the Folger Consort and friends. The “Banquet of Seasonal Ensemble Music,” as the performance is billed, is a nod to the 17th- century play written by students at Oxford University, in which Christmas dinner ingredients vie for their place at the table. The musical pieces are interspersed with Rick Foucheaux performing multiple roles from the play, including King Beef and King Brawn, as well as the chef. To begin the program, the five-member consort, accompanied by six singers, performs a beautiful rendition of the 14th-century piece Sub Arturo plebs/Fons citharizancium. Sung entirely in Middle English, the complex piece tells the story of legendary musicians, setting the stage for the music to come. After a return to the liturgical piece Alleluia, it's time for Rick Foucheaux’s first appearance, as the Hungry Belly. Foucheaux is an accomplished actor and longtime collaborator with the Folger Theatre. He seems to be enjoying himself immensely while performing this odd little piece of theatre. Just as Belly relishes the fact that Christmas dinner is coming, Foucheaux seems to relish the chance to dive into these different characters – with gusto and fun. The musical pieces are a beautifully seasonal way to celebrate the changes in language and verse throughout the centuries, while the addition of the play is a fun way to mix theatre with classical music. The singers and consort members work well together and accompany each other magnificently. Because much of the music is sung in Latin and Middle-English, it’s often difficult to know exactly what is happening in each song. The Folger Theatre seems to anticipate this issue by including the verses the singers are performing, as well as their translations, in the program. While it may seem a simple addition, it shows just how dedicated the team at Folger is to teaching and entertaining. The program ended with a sing-along of Hark! The Herald Angels Sing, and the Fantasia on Christmas Carols, by Ralph Vaughan Williams. While not as well-known as the first carol, Fantasia includes pieces from three complete Christmas carols, as well as instrumental quotations from several other carols. As far as celebrations of Christmas go, the performance of these two delightful seasonal pieces is the perfect way to conclude an evening of grand music by a collaboration of talented performers and instrumentalists, celebrating the season with their talent. A Christmas Messe plays through December 23, 2018, at Folger Shakespeare Library. For more information and to purchase tickets, visit Folger's website. Folger Shakespeare Library also held a birthday tribute for poet Emily Dickinson. Read all about it here! Stop by D.C.'s Our Community Now homepage to see what else is happening in your community!